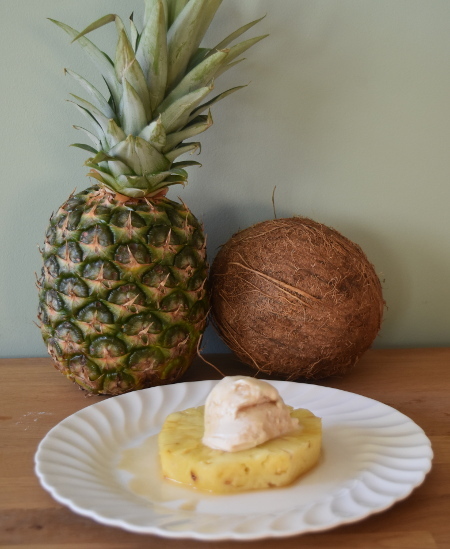 What could be better on a sunny day than boozy rotisserie pineapple with coconut ice cream? Very little methinks. This tasty and refreshing morsel will bring you some vibrant tropical flavours, sure to liven up any garden party. Rum is probably by favourite alcohol to use in barbecue cooking, as it always reminds me of summer and goes fantastically well with the tropical fruit that really brings home that summery vibe. Sadly the majority of the alcohol will evaporate, so the boozy rotisserie pineapple will (probably) not get you too drunk! It's also worth noting that I haven't just put alcohol in the ice cream for fun - it does have a purpose! Because alcohol has a lower melting point than water and other liquids that we cook with, it doesn't actually freeze in the freezer. This softens the ice cream and makes it easier to scoop if it's been in the freezer a while! When making the ice cream, it’s always easier to use an ice cream maker to freeze it. However, as I know not everyone has an ice cream maker, you can just pour the mixture into a large container, pop it into the freezer and give it a quick whisk every 30 minutes until it’s frozen. Either way, it’s better to eat the ice cream on the day of freezing, as if left in the freezer for long periods of time without stirring it will go rock solid! For this recipe we have used a Monolith Classic barbecue, mainly due to the rotisserie attachment they have. 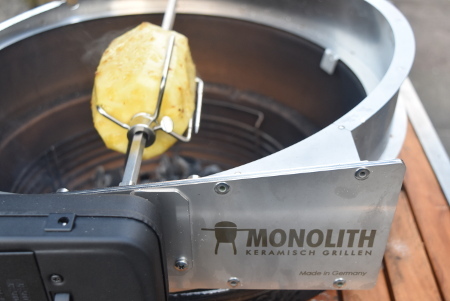 The mechanical rotisserie structure fits onto the barbecue and turns the rotisserie skewer steadily as the food cooks, allowing for the pineapple in this case to cook evenly all the way through. Serves 4-6 people. Prep time: 20 minutes. Freezing time (for the ice cream): 1 hour. Cooking time (for the pineapple): 45 minutes. Allergens: depending on which vegan butter you use, it may contain soy; however I use soy-free spreads. This makes about 1 litre of ice cream, so you’ll probably have some left over! If you don't want the hassle of storing the extra I'd just make half quantity, which should be plenty to serve with one pineapple. Begin by lighting your barbecue – you don’t want it hot at all; a temperature of 120°C (248°F) is perfect. For the coconut ice cream, simply whisk together all the ingredients until the sugar has dissolved - it really is that simple! Pour the mixture into your ice cream maker and set to freeze for 1 hour. Alternatively, pour your ice cream into a large container and leave in your freezer, giving it a quick whisk every 30 minutes until frozen. Moving on to the boozy rotisserie pineapple, start by peeling it – don’t core it. The best way I’ve found to do this is by cutting off the top and tail first, so that you have flat bottom to provide a steady base on which you can peel the sides of the pineapple. Get your rotisserie skewer, and push it through the core of the pineapple. This isn’t the easiest of tasks and requires a fair bit of strength – just make sure you don’t stab yourself! Next you can make the rum butter; start by softening the vegan butter for around 30 seconds in the microwave. Mix this together with the rum and brown sugar in a small bowl. Keep stirring until the brown sugar has dissolved. Dip a basting brush into the sweet rummy mixture, and brush the pineapple with it on all sides, giving it a good coating. Make sure you don’t use it all straight away as you’ll need some for later. Put your rotisserie-skewered pineapple onto the barbecue's rotisserie attachment, and leave to cook and rotate for around 45 minutes. Check on the pineapple every 15 minutes, basting it a little more with the rum butter mixture each time. 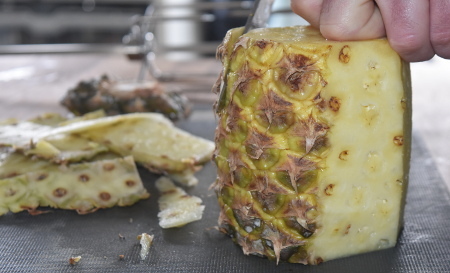 After 45 minutes, take the pineapple off the barbecue and carefully remove it from the rotisserie skewer - you're now free to core the pineapple, and cut it into slices. Take your ice cream out of the ice cream maker or your freezer ready to serve. 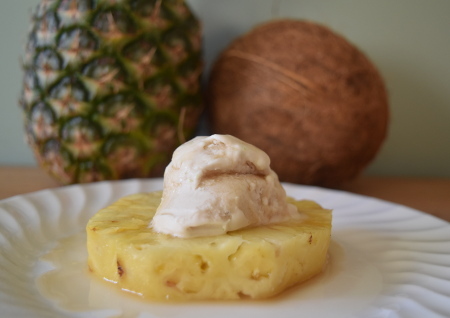 Serve one slice of boozy rotisserie pineapple with a good dollop of sweet coconut ice cream, and drizzle any leftover rum butter over the top - enjoy!